What is cucumber mosaic? Cucumber mosaic is a viral disease of worldwide distribution that affects over 1200 plant species. Hosts include a wide range of fruits, vegetables, herbaceous and woody ornamentals, and weeds. The disease has perhaps its biggest impact in vegetable production where it can cause significant losses in yield and vegetable quality. What does cucumber mosaic look like? Symptoms of cucumber mosaic can vary widely depending on host species, host variety, and time of infection. Typical symptoms include stunting of entire plants, mosaic or mottling (i.e., blotchy white, yellow, and light green areas) and ring spots (i.e., ring-like areas of discolored tissue) on leaves and fruits, and a variety of growth distortions such as cupping, puckering and strapping (i.e., elongation and thinning) of leaves as well as warts on fruits. In extreme situations, parts of an affected plant or even an entire plant may die from the disease. Where does cucumber mosaic come from? 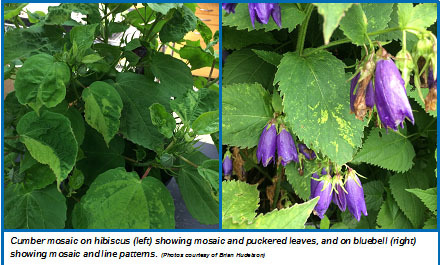 Cucumber mosaic is caused by Cucumber mosaic virus (CMV) which can overwinter in susceptible biennial or perennial weeds, as well as in perennial agricultural crops (e.g., alfalfa) and perennial herbaceous and woody ornamentals. Seeds and even pollen from certain host plants can carry the virus, and thus the virus can be spread via these plant parts. More commonly, CMV is spread by aphids [see the University of Wisconsin Garden Facts XHT1043 (“Aphids”) for details on these insect pests] which can pick up the virus from infected plants and transmit it to healthy plants as they feed. Over 80 species of aphids can potentially transmit CMV. The severity of cucumber mosaic oftentimes depends on the size and activity of aphid populations in an area, as well as on the number infected plants in an area serving as reservoirs for the virus. How do I save plants with cucumber mosaic? There is no known cure for cucumber mosaic. Infected plants should be removed and destroyed to eliminate the plants as potential reservoirs for the virus (which can subsequently be spread to other nearby healthy plants). Infected plants can be burned (where allowed by local ordinance), deep buried or hot composted. 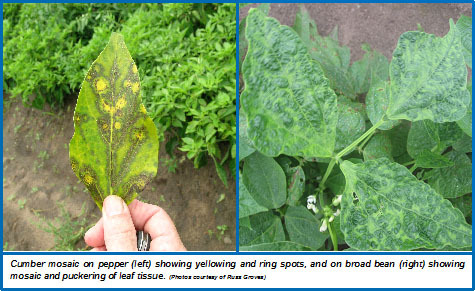 Killing infected plants with herbicides can also be an effective management strategy. How do I avoid problems with cucumber mosaic in the future? Buy certified, virus-free seeds and plants. Consider using CMV-resistant varieties of lettuce, spinach, cucurbits (e.g., cucumber, melon and squash) and other vegetables where available. Seed catalogs often contain information on CMV resistance that can be useful for variety selection. Remove weed hosts whenever possible around your garden and mulch vegetable and ornamental gardens to inhibit weed growth. Consider using floating row covers where possible to prevent aphids from reaching susceptible plants. DO NOT use insecticides to control aphids because such treatments are unlikely to act fast enough to prevent aphids from transmitting CMV, and may actually stimulate aphids to move and feed more widely, thus leading to increased spread of the virus.